Spring is around the corner and that means…..
IT’S SHOW TIME here at Leisure!! 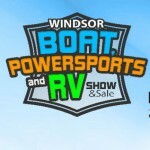 WINDSOR BOAT, POWERSPORT & RV SHOW & SALE!! This year it will be at Tecumseh Mall – in the old Zellers. — Enjoy two events in one location – the Windsor Home & Garden Show will also be there! Sport Boats, Pleasure Craft, Fishing Boats, Pontoons, Cruisers, Personal Watercraft and Outboard Motors, plus Canoes, Kayaks, and Sailboats. RV’s, Campers, and Pop-Ups. All styles and makes of Motorcycles and ATV’s. The latest 4×4’s, Trucks and SUV’s to tow and carry. Admission $10 – kids 16 and under are FREE!! !